Gianna Kathryn Brown was baptized today at Christ the King Catholic Church in Ann Arbor Michigan. I, Grandpa Steve Ray, did the first reading. I love this passage and use it to defend the Catholic teaching on being born again through baptism..
Click on the picture for a larger image. 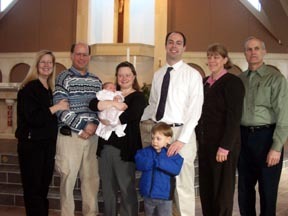 From left to right: Janet and Steve Ray, daughter Cindy Brown with Gianna, son-in-law Ben Brown and Dominic, Ben's parents Rhonda and David Brown. "For I will take you from the nations, and gather you from all the countries, and bring you into your own land. I will sprinkle clean water upon you, and you shall be clean from all your uncleannesses, and from all your idols I will cleanse you. A new heart I will give you, and a new spirit I will put within you; and I will take out of your flesh the heart of stone and give you a heart of flesh." (Ezekiel 36:24-26, RSVCE).